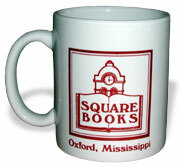 Drink your coffee with sophistication in your very own Square Book coffee mug. Choose from eight mugs, each with a different quote about reading and books on one side and the Square Books logo on the other. Mugs are Made in America. Eudora Welty "...It's living that makes me want to write, not reading-although it's reading that makes me love writing." Flannery O'Connor "Whenever I'm asked why southern writers particularly have a penchant for writing books about freaks, I say it is because we are still able to recognize one." Larry Brown "All we have to do as people is keep teaching our children to read, and the rest will more than likely take care of itself." Barry Hannah "The Deep South might be wretched, but it can howl." Richard Wright "Whenever my environment had failed to support or nourish me, I had clutched at books..."
Jorge Luis Borges "I have always imagined that Paradise will be a kind of library." William Faulkner "My own experience has been that the tools I need for my trade are paper, tobacco, food, and a little whiskey." James Baldwin "You think your pain and heartbreak are unprecedented in the history of the world, but then you read."